The Legend of Zelda isn’t a franchise that’s known for direct sequels, even with its established timeline. 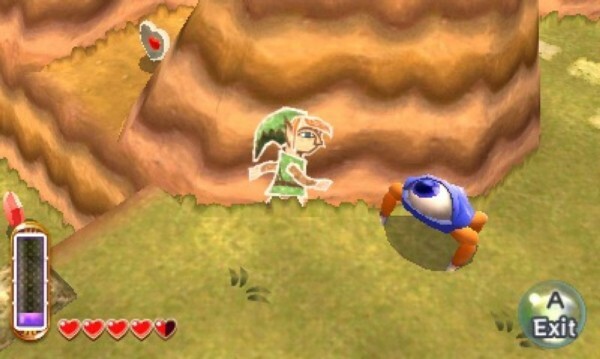 “A Link Between Worlds” is the direct sequel to “A Link to the Past,” and while it works off of nostalgia, it presents brand new features that shake up the franchise formula for the best. The first thing to point out is how well this game recreates the Hyrule originally presented to us over 20 years ago on the Super Nintendo. The map layout is almost identical to the original but the similarities end with the over world of Hyrule. The dungeons are different and rather than the dark world from before, gamers are given Lorule, an opposite kingdom to Hyrule. The series also goes back to a top down view rather than a behind the character view as is the norm. The top down experience is refreshing and works well with the 3D as it helps to increase the field of depth. Playing the game in 3D lets you see the different layers and heights, making the top-down effect look amazing. Another big change to the formula is the fact that you no longer progress in a linear fashion as you take down dungeons. Unlike previous series where you had to tackle dungeons in a specific order, you can now do it in any order. Meaning that you might not have the needed item to accomplish certain puzzles, but dungeons can also be completed without items, it just requires tons of experimentation and intellect. Another change is the item rental system. While players can still unlock the items as normal in the dungeons, they are all available from the start to purchase or rent for a lower price. This change allows players to tackle dungeons in however way they want meaning that those dedicated to finding rupees can tackle the first dungeon with an entire arsenal ready. One of the challenges presented is that if players die in a dungeon, all their rented items are returned to the store, leaving players stranded in the dungeon forcing them to think their way out. One of the complaints to the game is actually the protagonist, Link. Link no longer feels like a fleshed out character as he did in “Skyward Sword” or “Twilight Princess,” but rather he feels like a silent avatar void of any real personality, which is a shame since the world and the art style have so much life innately. Overall, this entry to the franchise breathes new, refreshing life and is a welcome change to an almost stale formula. This is the game to play if you’re a fan of the series or if you just want a great adventure title for your 3DS. Press [Start] to Game: ‘Adventure Time: Explore the dungeon because I DON’T KNOW!’ Yeah, I don’t know either.